The good news: You can obtain a license at any office of the city clerk in New York. The important stuff: You need to get your license 24 hours in advance of a legal wedding. The license will be stamped to the MINUTE, and you cannot be legally married until 24 hours have expired. Also, the offices close at 3:45 on Friday. ADVICE: plan your arrival so you have at least one day to get the license, and decide on the location. Here is the link to the city clerk's office, and the marriage license borough, with phone numbers and addresses. There is an office in each borough, and you may use any of them. The fee is $35US for the license, payable by money order or Credit Card. You may now apply online for your license, up to 20 days in advance, but you must still go together in person, stand in line, and wait while they print it up for you. You will need 2 forms of ID, with picture and address, and a passport is acceptable. If either of you has been married previously, you need to bring official documents listing the decrees of settlement. You will be asked about any previous marriages, and asked to indicate how the marriage was dissolved (divorce, against whom, death, etc. ), and the location of the former spouse. You will also be asked to prove who you are, where you live, and asked for the birthplace of your parents. It may take a deal of time at the Manhattan office, which is extremely crowded, and especially so on Fridays. So going early in the day is recommended. You will need at least one witness over 18 for the ceremony, but not to apply for the license. 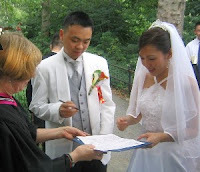 For elopements, many officiants have a photographer or an assistant who will serve as your legal witness.